Warm weather always brings out my desire to eat lighter and healthier. I start craving more fresh foods with the temperature rising, and I love having recipes that I can prepare in advance. Waldorf Salad is the perfect dish to make ahead of time and have in the fridge ready for lunches (or light dinners) all week long. This recipe would also be a perfect go-to recipe for entertaining or a picnic in the park! 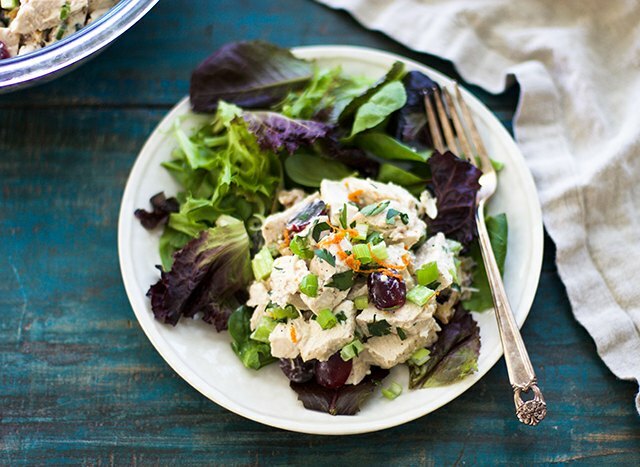 This recipe makes around 6 to 8 servings of Waldorf Salad. Double this recipe to feed a crowd. Preheat oven to 425 degrees F. Season chicken breasts with the olive oil, salt, and black pepper. Bake for 45 minutes or until the internal temperature of the chicken is 180 degrees. Let the chicken cool and remove the skins. Cut the meat off of the bone into small bite size pieces and place inside a large bowl. You can alternatively use a store-bought rotisserie chicken, but I highly recommend roasting the breasts yourself for flavor! Combine the Greek yogurt, mayo, green onions, parsley, orange juice, zest, salt and pepper and whisk to combine. Set aside. 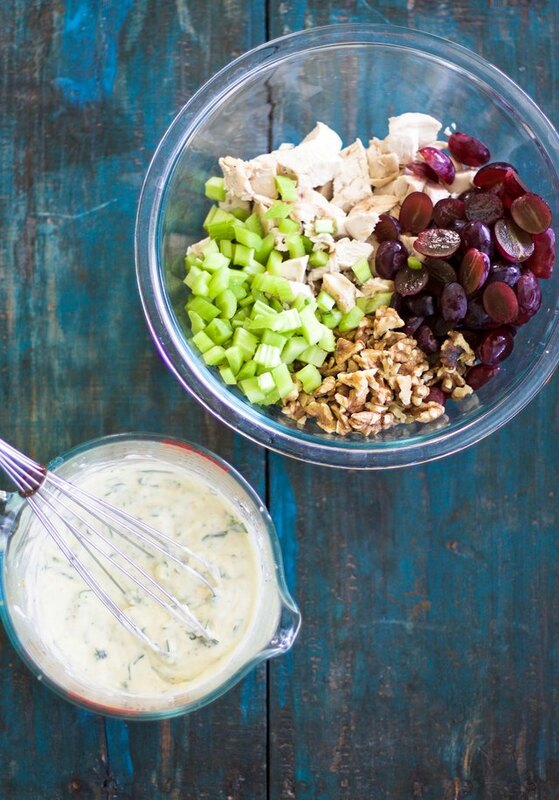 Mix together chicken, grapes, celery, walnuts, and dressing and stir to combine. Serve Waldorf Salad immediately or refrigerate up to one week. Serve as a sandwich or over a bed of lettuce. 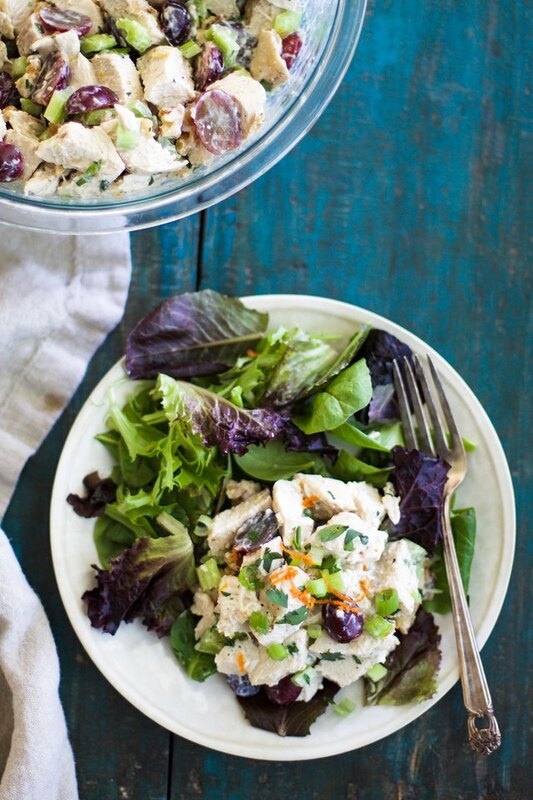 This Waldorf Salad is perfect for embracing the warm weather seasons!